It may be popular with professional athletes and Hollywood celebrities, but WBV also has very real clinical potential for patients with neurological disorders, including Parkinson’s Disease, multiple sclerosis, stroke, and spinal cord injury. Whole body vibration (WBV) has become increasingly popular over the last several years as a method of exercise training. As the name implies, WBV involves the application of a vibratory stimulus to the entire body, as opposed to local stimulation of specific muscle groups. This is typically performed by standing on a vibrating platform with knees slightly flexed. In some instances, simple exercises (e.g. squats) can be performed during WBV. WBV units typically provide their vibration by using either a rotational or vertical stimulus. With rotational vibration, the platform rotates about an anterior-posterior axis so that positioning the feet further apart results in increased amplitude of movement and applies force asynchronously to the left and right foot, similar to standing in the middle of a “teeter-totter.”(Figure 1) WBV units that provide a primarily vertical stimulus have a platform that moves vertically and symmetrically, causing simultaneous movement of the lower extremities in the same direction.1 (Figure 1) In addition to the direction of the vibration stimulus, several other training parameters are important to consider when using WBV, including frequency (Hz), amplitude (mm) and duration. Most commonly, WBV studies have used frequencies ranging from 25-50 Hz, amplitudes from 2-10 mm and total durations of 30 seconds to 10 minutes.2 Currently there is no consensus regarding the optimal parameters needed to achieve a specific physiological response. Figure 1. WBV units typically provide their vibration by using either a vertical (left) or rotational (right) stimulus. Although the majority of WBV research has focused on improving physical performance in normal younger adults, there is a growing body of research on the effects of WBV in clinical populations, such as those with neurological disorders. The primary purpose of this review is to provide a summary of the current literature regarding the effects of WBV on lower extremity performance and function in individuals with neurological disorders such as Parkinson’s disease, multiple sclerosis, stroke and spinal cord injury. Additionally, practical clinical considerations and safety issues will also be discussed. Unless specified, most of the reviewed studies required the subject to simply stand on the vibrating platform with knees slightly flexed. Only one study has evaluated the effects of a long-term training intervention using WBV in persons with PD.18 This study compared the effects of 30 WBV (25 Hz, rotational) sessions (two 15-minute sessions a day, five days per week) to conventional balance training using a tilt board. Following three weeks of training, both groups demonstrated similar significant improvements in measures of balance and motor function. The benefits were retained at a four week follow-up assessment. Multiple sclerosis (MS) is a chronic inflammatory, demyelinating disease of the central nervous system. Common symptoms include poor balance, spasticity, and motor weakness. These symptoms are especially prevalent in the lower extremities, with distal muscle groups often being more affected. Several researchers have evaluated the effects of WBV on lower extremity performance and balance in persons with MS. In a single-blinded randomized crossover trial, Jackson et al19 measured acute changes in lower extremity muscle strength using a dynamometer following a single 30 second exposure to either 2 or 26 Hz WBV (rotational). Strength was measured at one, 10 and 20 minutes post exposure. Although strength changes were not statistically significant, there was a consistent trend of higher peak torque production for both the quadriceps and hamstrings following the 26 Hz exposure compared to 2 Hz at all time points post WBV. Similar to some of the previously described Parkinson’s research, Schuhfried et al20 evaluated the effects of random (stochastic) low frequency vibration (2.0-4.4Hz) on postural control and function in 12 individuals with MS. In this double-blinded placebo controlled trial, subjects were evaluated using computerized posturography, the Timed Up and Go Test (TUG), and the Functional Reach Test. Subjects in the treatment group received a series of five one-minute WBV exposures and were then re-tested on all measures 15 minutes, one week and two weeks later. Results of the study showed a non-significant trend for improvement in computerized posturography scores at each of the post-test time points and a significant improvement in TUG performance at one week post exposure. Although the improvement in TUG performance was statistically significant, the change was small (1.0 sec) with questionable clinical significance. Only one study21 assessed training responses to a longer-term training intervention. In this within-subject counter balanced study, subjects received either exercise therapy combined with WBV (40 Hz, vertical) or exercise therapy alone for four weeks. Subjects then switched protocols following a two-week washout period. Outcomes included measures of tone, muscle force, sensation and functional performance. Results showed similar non-significant improvements in the 10-m walk test, TUG and muscle force production for both protocols. Two studies have evaluated the acute effects of WBV on postural control and muscle performance in persons with stroke. The first study22 measured changes in postural control in 23 individuals with chronic stroke using computerized posturography following four 45-second standing exposures to 30 Hz WBV (rotational). Following WBV, there was a significant (P < 0.01) reduction in the root mean square (RMS) center-of-pressure velocity in the anterior-posterior direction when standing with eyes closed. There was also a significant (P < 0.05) increase in weight-shifting speed. Although these findings indicate possible short-term improvements in postural control, there is no evidence that changes in discreet posturography measures lead to actual reductions in fall risk or improved function in persons with stroke. A second study23 measured acute changes in lower extremity torque production and electromyography (EMG) values in the knee flexors and extensors in acute stroke patients following six one-minute standing exposures to WBV (20 Hz). Immediately following the WBV, subjects demonstrated a significant (P < 0.05) increase in isometric and eccentric knee extension torque and EMG amplitude. There was also a significant (P < 0.05) corresponding decrease in knee flexor co-activation during the eccentric condition. However, it is unclear how long these changes may persist since the study only performed one immediate post-vibration measurement. Just one study24 has investigated the long-term effects of a six-week WBV training intervention in persons with stroke. In this randomized controlled trial, all 53 subjects were receiving acute inpatient rehabilitation. In addition to their regular rehabilitation, half received WBV sessions (4 x 45 seconds of supported standing or sitting [depending on patient ability], five days per week at 30 Hz [rotational]) while the other half performed the same amount of a “sham” treatment of simple exercises while listening to music. Following the six-week program, both groups demonstrated increased balance and function, but there were no differences in improvement between the groups. Only a single pilot25 study has investigated whole body vibration training in individuals with spinal cord injury (SCI). In this non-randomized trial, a group of 17 individuals with chronic (> 1 year) motor-incomplete SCI performed a vibration training program (4 x 45 seconds, three days/week for four weeks at 50 Hz [vertical]). Gait speed and characteristics were measured before and after training. The results demonstrated significant improvements in gait speed (0.062 m/s, P < 0.001) following training. These results are comparable to other forms of training that are much more time- and labor-intensive, such as body-weight supported treadmill training.26 An obvious weakness of the study is the lack of a control group. However, the promising results warrant further investigation. Abercromby et al1 also compared the potential harmful effects of vertical and rotational forms of WBV. They suggested that risks associated with rotational vibration may be lower because it is easier to dampen the mechanical energy transferred to the spine and head during rotational vibration by flexing and extending the lower extremities in an alternating fashion. They also found that maintaining knee flexion angles between 26º and 30° while standing on the vibrating platform minimized head acceleration and transfer of mechanical energy to the spine. It should be emphasized that prior to administering WBV, it is critical that all patients be carefully screened for possible conditions or co-morbidities that could increase the risk of unintended negative side-effects. 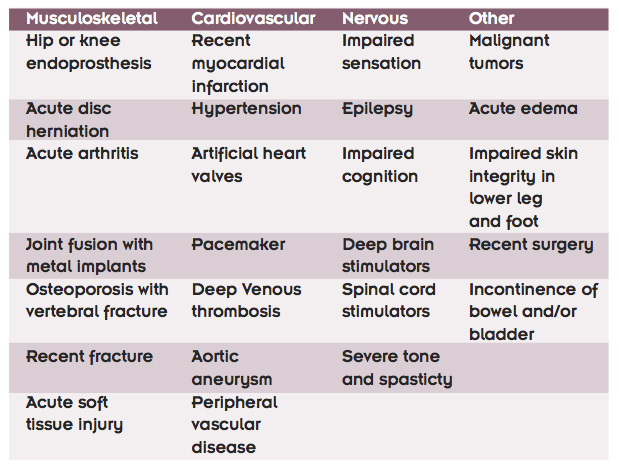 Table 1 lists some possible conditions and co-morbidities that may preclude the use of WBV training. WBV is an increasingly popular, novel treatment modality that may provide an alternative to traditional therapeutic exercise in carefully screened individuals with neurological disorders. However, the use of vibration training is still in the early stages of development and the results of current research have been inconsistent at best. Additionally, the WBV parameters used have been highly variable and most of the research has been methodologically weak. The safety and effectiveness of long-term ( > 6 weeks) WBV training has also not been evaluated. Despite the limitations of the current literature for persons with neurological disorders, there is a growing body of evidence in older adults and sedentary individuals that has shown a more consistent and positive response to WBV, especially when combined with simple exercises and applied in a systematic and progressive manner. This research has demonstrated improvements in lower extremity muscle strength that are comparable to traditional resistance exercise training programs.28,31-,33 This could be important for individuals with neurological disorders who can often not perform conventional strength training due to difficulty generating a voluntary muscle contraction, poor coordination and/or excessive fatigue. Since most WBV protocols require minimal coordination and relatively brief treatment exposures, WBV may offer a viable lower extremity exercise alternative for persons with neurological disorders. Kurt Jackson,PT,PhD,GCS, is the neurology coordinator and Harold Merriman,PT,PhD,CLT is the general medicine coordinator for the Doctor of Physical Therapy Program in the Department of Health and Sports Science at the University of Dayton in Dayton, OH. 1. Abercromby AF, Amonette WE, Layne CS, et al. Vibration exposure and biodynamic responses during whole-body vibration training. Med Sci Sports Exerc. 2007;39(10):1794-1800. 2. Jordan MJ, Norris SR, Smith DJ, Herzog W. Vibration training: an overview of the area, training consequences, and future considerations. J Strength Cond Res. 2005;19(2):459-466. 3. Cardinale M, Bosco C. The use of vibration as an exercise intervention. Exerc Sport Sci Rev. 2003;31(1):3-7. 4. Bosco C, Colli R, Introini E, et al. Adaptive responses of human skeletal muscle to vibration exposure. Clin Physiol. 1999;19(2):183-187. 5. Nishihira Y, Iwasaki T, Hatta A, et al. Effect of whole body vibration stimulus and voluntary contraction on motorneuron pool. Adv Exerc Sports Physiol. 2002;8(4):83-86. 6. Bosco C, Cardinale M, Tsarpela O. Influence of vibration on mechanical power and electromyogram activity in human arm flexor muscles. Eur J Appl Physiol. 1999;79:306-311. 7. Bosco C, Cardinale M, Tsarpela O, et al. The influence of whole body vibration on jumping performance. Biol Sport. 1998;15(3):157-164. 8. Torvinen S, Sievänen H, Järvinen TA, Pasanen M, Kontulainen S, Kannus P. Effect of 4-min vertical whole body vibration on muscle performance and body balance: a randomized cross-over study. Int J Sports Med. 2002 Jul;23(5):374-9. 9. Cormie P, Deane RS, Triplett NT, McBride JM. Acute effects of whole-body vibration on muscle activity, strength, and power. J Strength Cond Res. 2006;20(2):257-261. 10. de Ruiter CJ, van der Linden RM, van der Zijden MJ, et al. Short-term effects of whole-body vibration on maximal voluntary isometric knee extensor force and rate of rise. Eur J Appl Physiol. 2003;88(4-5):472-475. 11. Delecluse C, Roelants M, Verschueren S. Strength increase after whole-body vibration compared with resistance training. Med Sci Sports Exerc. 2003;35(6):1033-1041. 12. de Ruiter CJ, van Raak SM, Schilperoort JV, et al. The effects of 11 weeks of whole body vibration training on jump height, contractile properties, and activation of human knee extensors. Eur J Appl Physiol. 2003;90(5-6):595-600. 13. Torvinen S, Kannus P, Sievanen H et al. Effect of 8-month vertical whole body vibration on bone, muscle performance, and body balance: a randomized controlled study. J Bone Min Res. 2003;18(5). 876-884. 14. Turbanski S, Haas CT, Schmidtbleicher D, et al. Effects of random whole body vibration on postural control in Parkinson’s disease. Res Sports Med. 2005;13(3):243-256. 15. Haas CT, Turbanski S, Kessler K, Schmidtbleicher D. The effects of random whole-body vibration on motor symptoms in Parkinson’s disease. NeuroRehabilitation. 2006;21(1):29-36. 16. Goetz CG, Leurgans S, Raman R, et al. Placebo-associated improvements in motor function: comparison of subjective and objective sections of the UPDRS in early Parkinson’s disease. Mov Disord. 2002;17(2):283-288. 17. Arias P, Chouza M, Vivas J, Cudeiro J. Effect of whole body vibration in Parkinson’s disease: a controlled study. Mov Disord. 2009;24(6):891-898. 18. Ebersbach G, Edler D, Kaufhold O, Wissel J. Whole body vibration versus conventional physiotherapy to improve balance and gait in Parkinson’s disease. Arch Phys Med Rehabi.l 2008;89(3):399-403. 19. Jackson KJ, Merriman HL, Vanderburgh PM, Brahler CJ. Acute effects of whole-body vibration on lower extremity muscle performance in persons with multiple sclerosis. J Neurol Phys Ther. 2008;32(4):171-176. 20. Schuhfried O, Mittermaier C, Jovanovic T, et al. Effects of whole-body vibration in patients with multiple sclerosis: a pilot study. Clin Rehabil. 2005;19(8):834-842. 21. Schyns F, Paul L, Finlay K, et al. Vibration therapy in multiple sclerosis: a pilot study exploring its effects on tone, muscle force, sensation and functional performance. Clin Rehabil. 2009;23(9):771-781. 22. van Nes IJ, Geurts AC, Hendricks HT, Duysens J. Short-term effects of whole-body vibration on postural control in unilateral chronic stroke patients: preliminary evidence. Am J Phys Med Rehabil. 2004;83(11):867-873. 23. Tihanyi TK, Horvath M, Fazekas G, et al. One session of whole body vibration increases voluntary muscle strength transiently in patients with stroke. Clin Rehabil. 2007;21(9):782-793. 24. van Nes IJ, Latour H, Schils F, et al. Long-term effects of six-week whole-body vibration on balance recovery and activities of daily living in the postacute phase of stroke: a randomized, controlled trial. Stroke. 2006;37(9):2331-2335. 25. Ness LL, Field-Fote EC. Whole-body vibration improves walking function in individuals with spinal cord injury: a pilot study. Gait Posture. 2009;30(4):436-440. 27. Bovenzi M. Health effects of mechanical vibration. G Ital Med Lav Ergon. 2005;27(1):58-64. 28. Griffin MJ. Handbook of human vibration. Burlington, MA: Academic Press, 1996. 29. Lings S, Leboeuf-Yde C. Whole-body vibration and low back pain: a systematic, critical review of the epidemiological literature 1992-1999. Int Arch Occup Environ Health. 2000;73(5):290-297. 30. 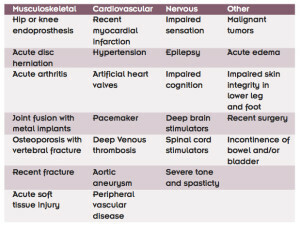 Seidel H. Selected health risks caused by long-term, whole-body vibration. Am J Ind Med. 1993;23(4):589-604. 31. Merriman HL, Jackson KJ. The effects of whole-body vibration training in aging adults: a systematic review. J Geriatr Phys Ther. 2009;32: 134-145. 32. Bogaerts AC, Delecluse C, Claessens AL, Troosters T, Boonen S, Verschueren SM. Effect of whole body vibration training on cardiorespiratory fitness and muscle strength in older individuals (a 1-year randomized controlled trial). Age Ageing. 2009;38(4):448-454. 33. Machado A, García-López D, González-Gallego J, Garatachea N. Whole-body vibration training increases muscle strength and mass in older women: a randomized-controlled trial. Scand J Med Sci Sports. 2009 Apr 20. [Epub ahead of print]. response from our occupational health and safety department. validate our desire for purchasing. If you could refer me to any place of reference I would appreciate it. Sorry for huge delay in response, but wasn’t involved with company at time. Please refer to the Juvent.com website for further information and details related to the Juvent device. This is the most studied device in the WBV space for rehab, bone density issues, balance and stability, etc. This was developed originally by two of the foremost experts in bone healing: Jack Ryaby, and Roger Talish, (EBI and Exogen). Sadly, both are passed, however Juvent lives on and we are anticipating the release of a Harvard study (VIBES) within the next 60 days which we believe will validate “smart” WBV called Dynamic Motion Therapy. We are now back in production as of December 2012. Let me know if I can be of further help.